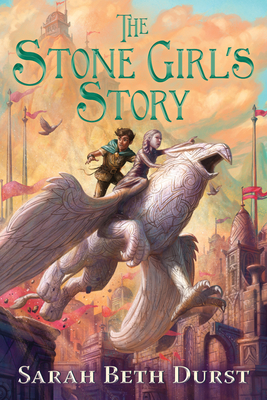 Exploring the power of stories and storytelling, Sarah Beth Durst presents the mesmerizing adventure of a girl made of living stone who braves unforeseen dangers and magical consequences on a crucial quest to save her family. Mayka and her stone family were brought to life by the stories etched into their bodies. Now time is eroding these vital marks, and Mayka must find a stonemason to recarve them. But the search is more complex than she had imagined, and Mayka uncovers a scheme endangering all stone creatures. Only someone who casts stories into stone can help—but whom can Mayka trust? Where is the stonemason who will save them? Action and insight combine in this magical coming-of-age novel as the young heroine realizes the savior she’s been searching for is herself. Sarah Beth Durst is the author of fantasy novels for children, teens, and adults. Winner of the Mythopoeic Award and an ALA Alex Award and thrice nominated for the Andre Norton Award for YA Science Fiction and Fantasy, she lives in New York. Visit her online at sarahbethdurst.com and on Twitter @sarahbethdurst.